Webtexttool is now available on Drupal. 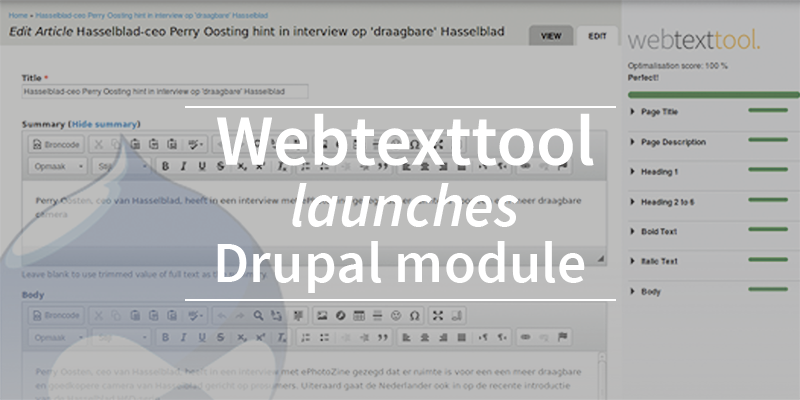 The module (or plugin) enables Drupal users to apply the webtexttool SEO suggestions directly in their Content Management System, while writing new web content. Both keyword analyses and the live SEO optimization suggestions are integrated in the plugin. The plugin is free and available via Drupal.org. Kyrill Poelmans, CEO of webtexttool, shared that a lot of users had the need for a integration with their content management system. We’ve started developing for these two platforms because both WordPress and Drupal are widely used systems. At the beginning of may we’ve launched the WordPress plugin.